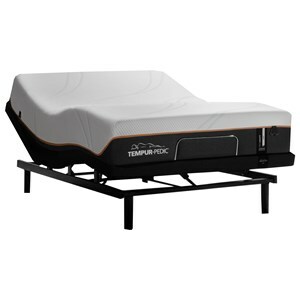 Experience a memory foam mattress designed to keep you cooler, featuring high quality materials for a luxurious sleep. Three responsive foam layers combine to form a mattress that is designed to sleep cooler, while delivering conforming comfort from head to toe. The top layer of ClimaLux gel memory foam is fused with the highest grade of temperature-regulated OUTLAST material, which is more effective at removing excess heat than standard gel memory foam alone. Four inches of UltraSense memory foam absorbs motion, while conforming to your body’s unique shape for individualized comfort. 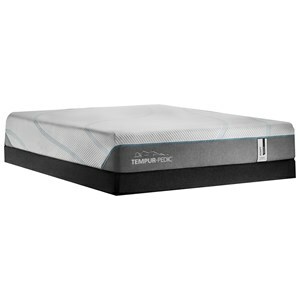 Underneath it all is an UltraCore layer made of high-density foam for a more supportive night’s sleep. The Monogram Annalise King Gel Memory Foam Mattress and Foundation by Stearns & Foster at Thornton Furniture in the Bowling Green, Alvaton, Glasgow, Scottsville, Franklin area. Product availability may vary. Contact us for the most current availability on this product. 501018K King Gel Memory Foam Mattress 1 12"
601000TXLK Twin XL/King Foundation 2 9"
Mattress Construction Mattress cover features cashmere and silk fabrics. Cashmere creates a luxuriously soft and inviting feel. Silk provides additional softness, and its breathability helps regulate heat. Coils and Support 6" UltraCore is made with high density InfiniLux foam for a more supportive sleep experience. A vision of luxury and innovation, the Stearns & Foster Monogram Collection features the finest memory foam mattresses in the world. The soul of the Monogram Collection rests in a unique combination of three responsive foam layers, creating a foam system designed to sleep cooler while conforming to your body. Each Monogram mattress is constructed with the highest quality materials by certified Stearns & Foster craftsmen, with a process and attention to detail that takes twice as long as it does to produce a regular memory foam bed. The Monogram Annalise collection is a great option if you are looking for Mattresses in the Bowling Green, Alvaton, Glasgow, Scottsville, Franklin area. Browse other items in the Monogram Annalise collection from Thornton Furniture in the Bowling Green, Alvaton, Glasgow, Scottsville, Franklin area.